Image caption Dr Niek Buurma said Cardiff University staff felt "frustrated"
More than 250 members of staff are calling on Cardiff University to back a referendum on the final Brexit terms. In an open letter the staff members say the university should take a more "pro-actively pro-European stance". Dr Niek Buurma said there was frustration that the university was not influencing the Brexit debate to "the extent we would like". A Cardiff University spokesman said it was "acutely aware of the impact of Brexit on our European staff". The letter has been signed by 252 members of staff of UK, EU and non-EU backgrounds from nearly all of the university's academic schools. According to its latest accounts, the university has more than 5,000 staff members. "We are all united in the belief that Brexit poses a serious threat to our careers, us personally in terms of well-being, to Cardiff University as an institution, and therefore, to its staff and students," the letter to vice-chancellor Prof Colin Riordan said. "It is our perception that Cardiff University has kept a remarkably low profile since the referendum in speaking out against threats to our institution, and against the anti-intellectual and indeed openly hostile approach of those that are supposed to deliver the 'best possible Brexit' for us. "We believe Cardiff University should take a more prominent, vocal, and pro-actively pro-European stance, both internally and externally." The signatories called for any Brexit impact assessments carried out by the university to be made public. Dr Buurma, a chemistry lecturer, said staff members were "frustrated" that such assessments had not already been published. "I don't expect there to be a benefit to Brexit but even if that were the case then we need to know that information," he said. The Dutch-born academic added that a number of EU nationals "don't feel very supported by the university" even though "some of us may be seriously affected by what's going to happen". 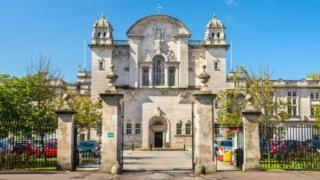 A Cardiff University spokesman said: "We received the open letter today and will respond to the detailed points raised within it in due course. "We are acutely aware of the impact of Brexit on our European staff and are committed to doing all we can to support them. "Cardiff University is an international community that values staff who come to work here from around the world. We have around 600 staff from non-UK EU countries. "This diversity fosters creativity and innovation and is an important part of our culture. This will not change because of Brexit." In October 2017, Welsh Conservative MP for Monmouth David TC Davies left a Cardiff University seminar in Westminster having raised concerns about universities "belly-aching over Brexit". Some of the university's pro-Brexit lecturers include Prof Patrick Minford and Kent Matthews of the group Economists for Free Trade.